«©NCSX» Brand new and factory boxed AC Adapter Pocket for the Gameboy Pocket or Gameboy Color which powers the handhelds with DC3V rated at 350mA; the center core is positive. 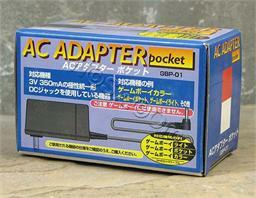 Hori's AC adapter may be used with Japanese and North American Gameboy Color/Pocket handhelds but are not compatible with European GB Pockets. Hori originally shipped the adapters to vendors in Japan over 14 years ago and they've been sitting in storage since then. 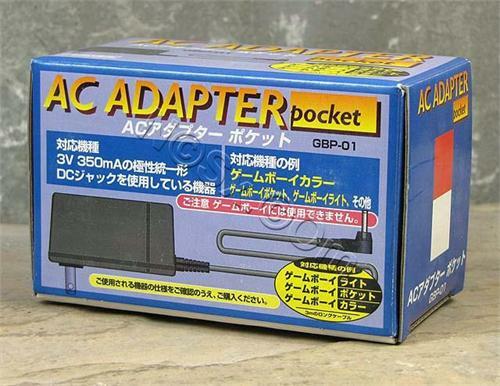 Although they're not official Nintendo brand, the adapters are an officially licensed production of the Gameboy Color/Pocket AC adapter from a well known manufacturer of accessories. NCS' remaining inventory is brand new and factory boxed in the original cardboard container. The condition of the packaging is in excellent structural shape with little to no signs of wear or weathering. A cardboard retainer inside the box keeps the adapter stable and secure from shuffling around during shipping. Pricing per AC Adapter is set at US$11.90 each. If you reside in the USA, NCS recommends USPS First Class Mail shipping for the most economical domestic service. For our customers outside the USA, NCS recommends normal Airmail International service. This document and photos are ©NCSX 2010. All rights reserved. No reproduction in whole or in part of this document may be made without express written consent of National Console Support, Inc.
Pokemon still holds sway over the hearts of children around the world although the craze of yesteryear has subsided somewhat. A few years ago, Nintendo released a gadget which attached to any Gameboy Advance handheld and plied the Pokemon trade once more. A replacement lithium-ion battery rated at 3.7V 1000mAh for the GBA SP which touts 16 hours of gameplay on a full charge. New and factory box Super Gameboy Commander for the Japanese Super Famicom (16-bit) which was designed for use with the Super Gameboy peripheral.